You haven't experienced state-of-the-art portable lifting convenience until you've used the BendPak LR-60P. This 6,000-lb. capable lift comes loaded with an electric / hydraulic power system, multi-position safety locks, rubber lifting blocks, a dropped crossbar for added clearance and a heavy-duty steel channel frame. Let the portable LR-60P take those vehicles and your service capabilities to new heights. When you need to add versatility and productivity to your shop or garage, your first stop should always be a BendPak. 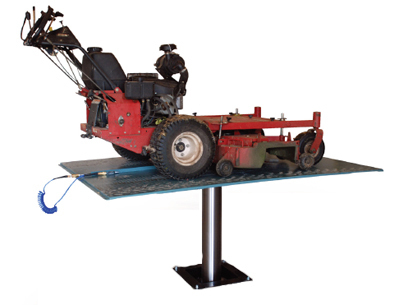 Simple, safe and rugged; this rubber-topped low rise lift can handle a mighty 6,000-lb. load without hogging your precious floorspace and can happily fit into narrower bays. The LR-60P is the ideal solution for quick service on today's passenger cars and light trucks. With wide rubber pads, wheel service and auto-body repair can now be performed on a surprisingly large variety of vehicles. And when you're done, just wheel it over to the next bay. All in all, the LR-60P is perfect for servicing cars and light trucks. For even more adaptable versatility, the included solid rubber lift blocks can be positioned in a variety of pick-up points on unibody and frame-contact undercarriages. Just make sure that you compare your vehicle specifications, including ground clearance and overall height, with the specification tables below before you buy. Always bet on BendPak for increased durability, safety and productivity. You aren't going to find comparable quality or value anywhere else-BendPak always bests the rest. Love the compact lifting of the LR-60P, but would prefer a non-portable version? Check out the LR-60P. A low 4" collapsed height accommodates most vehicles. If you're going to do heavy lifting, you need a solid base. Integrated into the single hydraulic cylinder is a one-piece, pilot fitted, machined steel piston that is wrapped with specially designed, pressure loaded U-cup piston seals, backups and wear bands that virtually eliminate any fluid bypass. The micro-smooth chrome-rod is machined from high-yield, ground and polished C-1045/50 micro-alloy steel and plated to a minimum of .001" diametrically, to ensure superior cylinder operation and life. The superior-design high durometer, mechanically-loaded rod seals make rod leakage is a thing of the past while a specially formulated abrasion-resistant urethane rod wiper provides exclusion protection. The welded cylinder body is made from robust steel tubing produced to exceed ASTM specifications. This combination of superb base material and superior processing ensures that the cylinders remain straight, smooth and last a very long time. All low-rise lifts feature a durable powder-coat finish that gives the metal a high-quality, extremely durable finish which can withstand even the harshest environmental or chemical conditions. Unlike other companies that claim to powder coat, we take pride in our meticulous 10-step process. First, all parts are visually inspected before being sandblasted. Afterwards, the parts are washed in our 5-stage phosphate tanks that can accommodate parts up to 25' long. Once cleaned, they're immediately dried to avoid rust production, and then outgassed. Outgassing pre-bakes the parts in a curing oven, reducing the possibility of blemishes that may be hiding in the pores of the metal. If not properly outgassed, imperfections in the metal may bubble during the curing process and most likely will cause chips in the powder. After the parts are washed and outgassed, any surfaces and / or threaded holes that need to be masked or plugged, are done so with high-temperature masking tape and silicone plugs. Next, the parts are given a quick thinner wipe to remove any light debris or fingerprints, before being hung on an electrostatically grounded conveyor line. The powder is finally applied using an electrostatic spray gun. The powder "sticks" to the surface in a fashion similar to how dust sticks to a television screen. Once the parts are powder coated, the carts are rolled into our curing oven and baked at 400° F for 45 minutes. Others charge extra for these necessary adapters, but they're standard with every LR-60 lift. Motor 110V - 220 VAC / 60 Hz. / 1 Ph. Duration: From the date of purchase by the original Purchaser or 12‐24 months from the date of shipment by BendPak or whichever comes first. 4. What is covered under this warranty: manufacturer defects due to material and/or workmanship with the exceptions noted below. c. Items or service normally required to maintain the product, i.e. lubricants, oil, etc. b. In some cases, components may be required to be shipped to the nearest BendPak Authorized Service Center. Freight costs, after 12‐months, must be borne by the Purchaser. c. Use reasonable care in the operation and maintenance of the products as described in the owner’s manual(s). 8. When Warrantor will perform repair or replacement under this warranty: Repair or replacement will be scheduled and serviced according to the normal work flow at the servicing location, and depending on the availability of replacement parts. *Free‐shipping applies to direct shipping points within the 48 continental United States. Rural area shipping surcharge may apply for remote addresses. 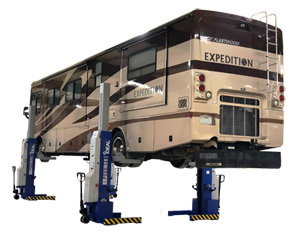 **For all BendPak brand Low‐Rise and Mid‐Rise Surface Mounted Vehicle Service Lifts (excluding specialty lifts, high rise, commercial parking, material handling, or models for particular purpose) manufactured on or following 7/27/2012. BendPak/Ranger shall have no obligation pursuant to this Warranty with respect to products which in our sole judgment have been altered damaged, misused, abused, badly worn, lost or improperly maintained. This Warranty is null and void if the customer or any other person other than an authorized representative of BendPak/Ranger has made any attempt to service or modify the tool prior to its return to BendPak/Ranger under this Warranty. In no event will either party be liable for any damage caused by the other party's failure to fulfill its responsibilities under these terms and conditions. In no event will either party be liable for any lost profits, lost savings, incidental damage, or other economic consequential damages. All expressed and implied warranties, including the implied warranties of merchantability and fitness for a particular purpose, are limited in duration to the coverage period. No warranties, expressed or implied, will apply after this period. BendPak may modify these terms and conditions at any time by either providing the customer with written notice or posting such revised terms on www.bendpak.com. Such revised terms shall be effective thirty days from the date of such written notice or posting.